A very nice print in an 8x10 inch mat signed and titled by RAK in a spoof style of art called the Superfreek style!!! The superfreeks were created to put a little fun back into the characters we all grew up loving, and to put a new spin on some of our favorites. They are really awesome!!! Second, on an original art sketch of ROBBY THE ROBOT, also by RAK, and done directly on the mat with colored Art Stix. RAK is the only artist out there who embellishes his mats with mini original art sketches to make them truly collectible treasures. Imagine how cool this looks on your wall, desk, or next to your action figure, toy, or bust!!! This is a one-of-a-kind sketch done on thick acid free crescent art board and it's actually more like a mini painting than a sketch!!!! This is a must have, totally original style of art! 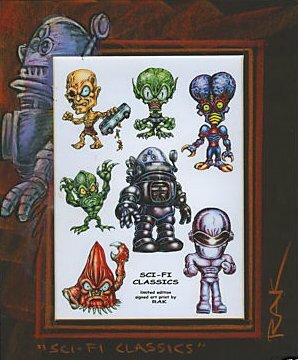 Art includes Gort from the Day the Earth Stood Still and alien monsters from several classic films from the 1950's.